Today’s learners come from increasingly diverse backgrounds and, as a result, have diverse needs. Tools must be carefully designed with flexibility and accessibility in mind to meet these needs. A working student may need a way to study for their classes while on the bus commuting to their job, for instance, while a student with hearing difficulties will need platforms that don’t rely on audio. With Amazon Transcribe’s Automatic Speech Recognition, Echo360 is improving the learning experience for all students by developing capabilities for smarter search, deeper ways to engage with content, and a pathway for colleges and universities to offer effective and affordable closed captioning for all academic video. Using this service, transcripts from educational sessions can be created automatically and seamlessly integrated into the Echo360 platform. Students can review recorded class content alongside a transcript of what was being said at the time. If a section of the lecture is particularly interesting or important, students can copy the corresponding part of the transcript and include it in their notes from that class. This gives them the confidence to focus on listening to and engaging with the lecture in real time instead of trying to write down every word that the instructor says. 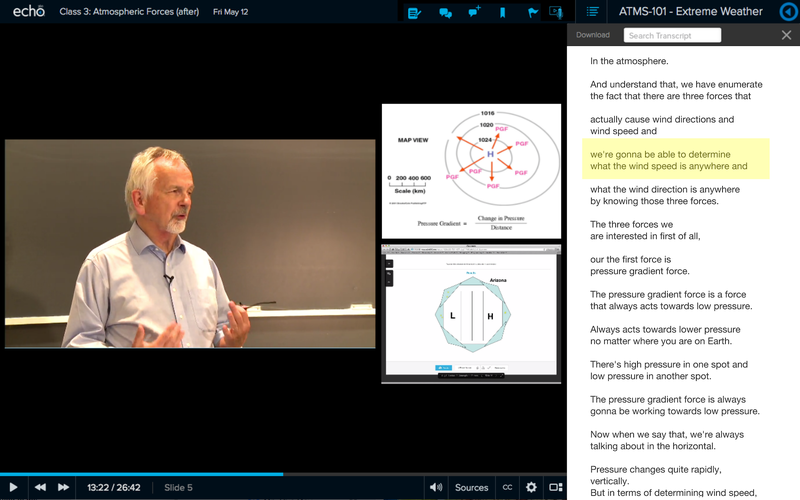 Because they can be aligned with the video recordings based on timestamps, the transcripts are not only readable, but interactive, with students able to click on phrases to navigate to a specific point in the video. Students can also search for key terms, making it easier to review a concept or subject. Due to their initial accuracy, Amazon Transcribe’s transcripts can be quickly edited to be completely accurate. With highly accurate transcripts, more students will be able to take advantage of videos, creating a more equitable, accessible classroom where all students have access to the same tools. Amazon Transcribe will enable features that the Echo360 team has not yet even considered. Having access to accurate, affordable transcriptions is an important resource, and Echo360 and its partner colleges and universities look forward to exploring all the ways the tool can make learning more flexible, accessible and equitable. If you’re interested in learning more about Echo360 and how institutions use Echo360 to provide students with active, engaged and personalized video-based learning, please visit its website.